Good morning all! 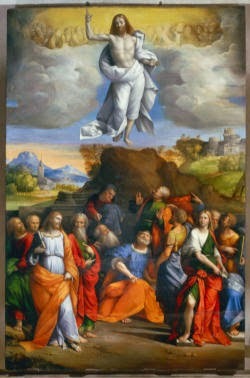 Happy feast of the Ascension to you. I live in a province in which this holy day of obligation is *not* transferred to the following Sunday, and I didn't realize that this was somewhat of a controversial issue. :0 Via the wonders of social media ;) I am now informed. There are only a handful of provinces (New York, Boston, Hartford, Newark, Philadelphia, and Nebraska) that retain this holy day of obligation on its Thursday placement, 40 days after Easter. I know many Catholics who feel slighted because they would like to attend Mass for the holy day on its traditional date. If you live outside of one of the aforementioned provinces, the readings at Mass today would be for Thursday in the Sixth Week of Easter. At any rate, it was in fact an obligation for me to attend Mass today in my diocese, but I see holy days of obligation in such a positive light. I love the opportunity to prioritize morning Mass during the week, I miss attending daily Mass so much. When I was younger, I often attended Mass at noon during the week. I rarely do this anymore, and its because I'm just at a different state in life now. Previously, I was a student in school, or was single and working, and it was easy to carve out time to walk to lunchtime Mass, and there were churches very close to me. Now, to attend Mass at lunch, I have to walk out to my car, which is parked about a 5 minute walk away from the library, that's just the way the parking situation is here on this campus, and then drive to Mass, and the entire shebang is just highly time consuming and inconvenient. Instead, I LOVE morning Mass now, it's such a wonderful way to start the day. That isn't always easy, given that my parish's Mass is at 8 am and if I have something going on at work right at 9 am, I won't make it. But I do what I can. This morning, I was scheduled to lead a meeting at 9 am, so I was in a bit of a bind. However, I scouted out churches (I take this task very seriously, and am proud of my abilities in this regard :0) and found a parish on my drive into work that had an 8 am Mass. It's close enough to campus that I thought I could make it to the library in time for my meeting if I didn't stop at my office beforehand. I had to leave home about 15 minutes earlier than usual, but obviously, very worth it. And so it was. Mass was absolutely lovely. During the homily, the priest described the feast of the Ascension as being a time of Christ rising in each of our lives in small ways. We all woke up earlier and carved out time to attend Mass, an evidence of Christ working in our life this very morning. We can do small things like add in even a few additional minutes of prayer to allow the Lord to rise in our life on other days as well. I just loved how he framed this. But anyway, it was a lovely start to the morning. I was thinking as I was sitting in my pew how I felt connected to other Catholics around the world attending Mass for this feast day. And isn't that a beautiful thing? 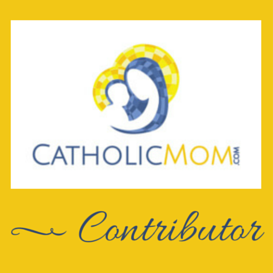 Ok, so let's chat: is the Ascension a holy day of obligation in your diocese? If it isn't, would you rather it be so? Leave me a comment! It is a holy day of obligation in the Portland, Maine diocese & for that I am thankful! I love your priest's homily- I am going to ponder those words and how they might apply in my own life. Sadly, I let someone who was working a crossword puzzle DURING mass distract me. Sigh. I really need to work on my ability to focus better on the mass..to think what I might miss..
Oh my. You see something new everyday, I suppose. :0 Hang in there, girl! I am the queen of Mind Wandering. Been like that since I was a kid. No. Unfortunately Canada has less obligations than the US. We have two (I think) Christmas and January 1st outside of the typical Sunday. Fortunately, we have a fine priest who will offer special Masses on those traditional obligation days. He didn't for this one, but that may be because he hasn't been at many Masses lately. We've been having a sub. I'm not sure what he's been up to. Would I like it as a Holy Day of Obligation? Yes...and no. If it was a HDofO I would have to cart two small children with me. I try not to remember the fiasco of Ash Wednesday. But at the same time when I'm grey and my children are less likely to pew dive, I would like to go to it. One can only dream of that day right? I mean my 4 year old is finally memorizing prayers. I never thought I would see that day either. 4 does seem to be a bit of a magic age. It's not like everything suddenly gets the Easy Button or something like that, but things do seem to shift for the better with regard to behavior in church. It was like that for me with Henry, too. It isn't in mine (Richmond), but I go to a parish run by the FSSP so we follow the 1962 calendar, so I did get to go to the Ascension Mass at 7 AM (right before school)! But because the diocese transfers the celebration to Sunday, it isn't a day of obligation.